The Moof bike by Amsterdam-based designer Ties Carlier features a striking tubular form that certainly draws one’s eye, but what really caught our attention was their smart solution to a rather simple problem. Rather than attaching clunky (and easily stolen) led lights to the bike, the design elegantly incorporates two solar powered lamps within the bike itself! Many attendees at this year’s CES were intrigued by the bold lines of the Moof bike being shown at Areaware’s booth. 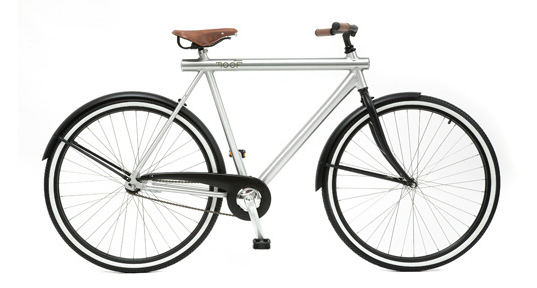 The single-speed bike boasts leather seats and handles in addition to an aluminum frame that contains two solar powered lights (one at the front, and one at the back). Its striking spartan form makes quite the statement and it certainly looks built to stand the test of time. 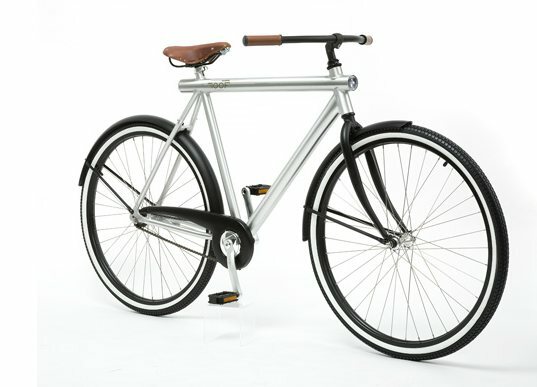 The bike will set you back $500, and will be available soon from Areaware. That will certainly take a lot more to ship across the planet to me than a little LED lamp that bolts on and I solar charge at home. nonstandard == non sustainable bike standards have been developed over the course of 100 years. what happens in 5 years when these bikes are no longer made, and you can no longer replace the non standard light. further while aluminum is a fantastically recyclable material. steel, which is much more durable material for bike building, is nearly as highly recyclable. further the design is quite inelegant. they could have at least photo'd the bike with the saddle at the correct height with the proper amount of stem showing. "Gee and here was I thinking leather was a hard wearing, fully biodegradable material!" I appreciate this alternative perspective. I guess leather's merits in contrast to plastics does need to be evaluated. And by the picture it appears that the saddle is a Brooks, which are reviewed to last lifetimes and be the most comfortable saddle in the world. That has its merits too! Where are the solar panels? How long do the batteries last and how much sun does it take to recharge them? Sure it's a pretty bike, and built-in lights are a great idea, but details..? i love the way the led lights are hidden? But... where tha heck do they get the solar energy from? "Nothing says green like dead animal skin stretched across your seat and handlebars!" Gee and here was I thinking leather was a hard wearing, fully biodegradable material! that's an expensive flash light... $500 is way too much for a bike without gears, no matter how "fashionable"
Nothing says green like dead animal skin stretched across your seat and handlebars! Incorporating solar into bike design is great idea though, especially for low-energy use devices such as LED lighting. Hope to see more of that. Perhaps with the new flexible photovoltaic systems, bike tubing will incorporate the technology and have power jacks in the headset for plugging in headlights, bike computers and gps units! The Moof bike by Amsterdam-based designer Ties Carlier features a striking tubular form that certainly draws one's eye, but what really caught our attention was their smart solution to a rather simple problem. Rather than attaching clunky (and easily stolen) led lights to the bike, the design elegantly incorporates two solar powered lamps within the bike itself!